I live in a beautiful city full of beautiful people (in coastal Southern California). Petite, bikini-clad women and hard-bodied men frequent the beaches. Healthy-minded folks demand spa-style cuisine and organic coffee shops. Go for a drive on the weekend and you'll see bike riders and runners everywhere you look. And let's just say that cosmetic surgeons do quite well here. I won't ever be classified as 'petite.' I'm rarely seen in a one-piece bathing suit (let alone a bikini!) I'd order Mexican food over a salad anytime. I might bike or run around the neighborhood (but no further). And I haven't had any plastic surgery. I do love where I live, but I've had to come to terms with the fact that I just won't ever be one of those people, and I'm still working on feeling okay about that. My newfound 'love' of exercise and eating healthy is turning out to be a wonderful experience. Who knew that there could be recipes out there that can be so satisfying and delicious, and they don't make you fat? My family is going to benefit from this as well. I don't want junk around, so there won't be junk around! I find myself thinking more about experimenting with new, fresh flavors as well as how I can incorporate more vegetables in my meals. 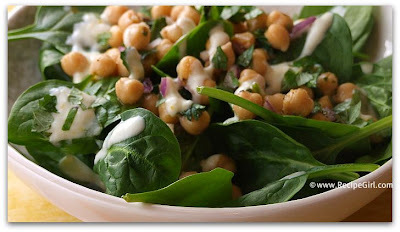 My new favorite lunch: Chickpea & Spinach Salad with Cumin Dressing. 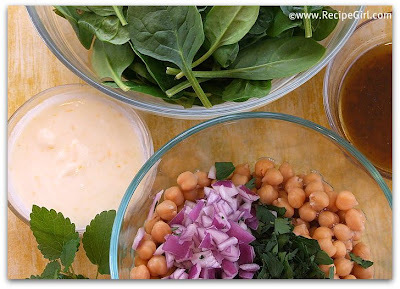 Look at all of those fresh, spa-like ingredients... fresh spinach, chickpeas, red onion, Italian parsley, a lemony cumin vinaigrette, and an orange-tainted yogurt sauce! Am I on the right path to healthy eating or what?? This was a fabulous lunch choice from Ellie Krieger's The Food You Crave. I paired it with some leftover shredded lamb and a few orange slices to make a complete and filling mid-day meal. I actually sat down... in the kitchen to eat this salad. Usually I'm on the run or eating in front of my computer screen. I forced myself to eat slowly, relax and enjoy my lunch. 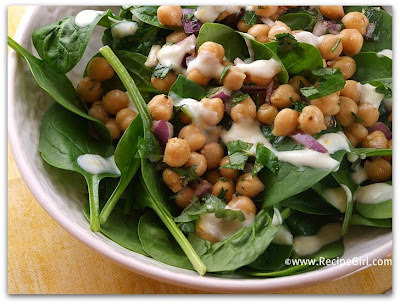 It was a wonderful salad with a light & flavorful dressing. 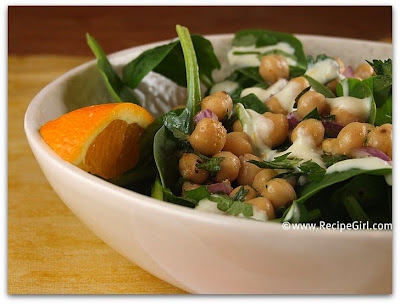 Salads are pretty much a lunch staple around here, but it was nice to make one that was a little bit different. Those spa-obsessed, perfect-people mentioned above might even like this one too (but none of them were invited to my house for lunch). If you're interested in reading about my daily progress in this healthy venture, go to this post.